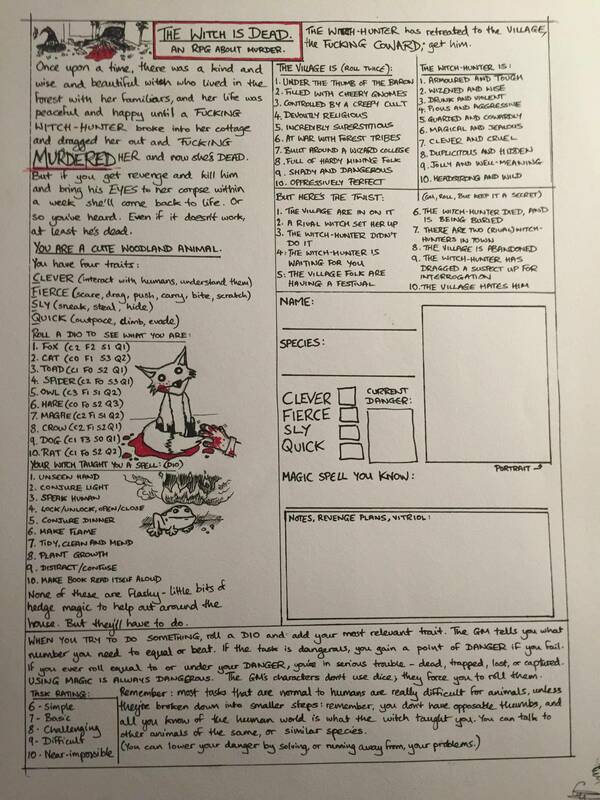 So yeah, this guy writes super-neat, supercondensed RPGs that completely fit on one page. So other than that, Sword & Scoundrel Pocket Edition WHEN? Wow! Now that's a cute little piece of ingenious game design! I've always been a big fan of one-page RPGs. I've never gotten the chance to play much with them, aside from the odd pick-up game, but the concept is really neat. From a design perspective, it gets even more interesting. There is a certain kind of challenge in seeing how far you can pare something down and still keep it working and fun. Restraint breeds creativity, and all that. Btw, got a question for native speakers. There's a strange animal listed in this game that just can't identify. It is listed under number 7 and called "magre". Any idea on what it could mean? Oh! I misread it. My bad. And now it seems so obvious!